You will be clearly spoiled for choice when it comes to the best locks to use for a gate. These locks can range from those that are simple to fit to very complicated ones that come with installation manuals for reference. You might be looking for locks for a wooden gate, a garden gate or even a garage door. The idea here is to ensure your own safety and that of your loved ones including children and pets. 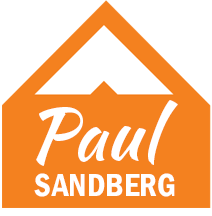 Consequently, you’ll need to sample some of them from a variety of readily available options ensuring that the one you choose is the specific perfect fit for your personal needs. A Brenton Padbolt has no challenges to fit. Armed with screws, bolts and other appropriate tools, you can simply attach it to the front or back face of your gate. You will need a padlock to secure it though. It isn’t suitable for a garage door as you have to close and open it from the side on which it is fitted. A Lokklatch Magnetic Gate lock is suitable for gates having square posts ranging between 1.5″ and 6”. It is suitable for a gate that has a gap between 3/8” and 1-1/4” and comes complete with two keys and a vertically or horizontally adjustable latch. There are instructions for its installation on gates made from vinyl, metal or wood materials. 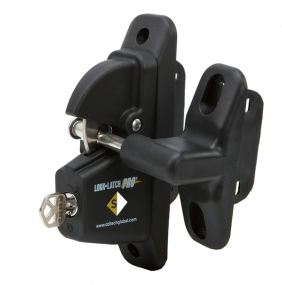 The Lokk Latch Combo is an amazing lock that enables one to lock the gate while outside. It is suitable for gate posts of thickness range between 1” and 6”. It is made from polymer and stainless steel. 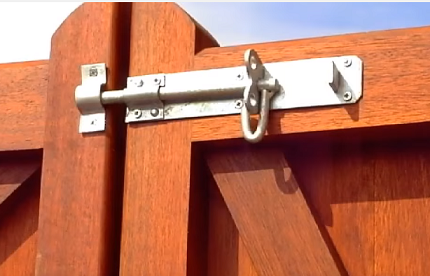 One size of this lock fits gates made from wood, metal and vinyl materials. The lock has two keys for locking and unlocking your gate. The lock latching mechanism also has a “pull” side and a “push” side latching effect on the inner and outer parts of the gate respectively. It comes in black or white colors complete with installation instructions. A Mortice Deadlock is for those who have a keen eye for security. It is fitted deep within the gate and so the only way of removing it is by opening the gate doors. This lock is suitable for garage doors. You must purchase rebate kits for doors that overlap when they are closed. Since the lock fits within the gate, the minimum thickness of the gate should be 44mm although it can vary with different locks. The beauty of this lock is that you can lock and unlock your gate whether you are out or inside. With The Lokk Latch Pro SL, your gate is locked automatically once it is closed but can be unlocked using a key from any side of the gate. You cannot reopen the gate any other way. This type of lock is suitable for gates installed at apartments, commercial buildings or even gated communities. This lock can fit on gate posts of up to 6” thick. 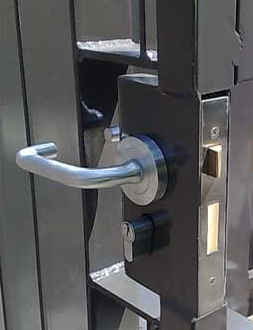 The gate lock is made of glass, polymer and stainless steel components and is available for two models of gates: first for vinyl gates or secondly for those that are made from wood or metal. As with others in this category, it also comes with installation instructions to make your installation task easy. If you are still looking for an appropriate lock just for you, the Side Pull Magna Latch could just be the one you need. There are two options for this type of lock, one that doesn’t need to be locked with a key and the other that needs a key. It has a magnetic latch and fits on gates not exceeding 3/8”. The gate should have proper alignment with the fence for effective use of this lock. It is recommended to use the one with a key lockable latch on a swimming pool gate in order to ensure the safety of children or even pets. 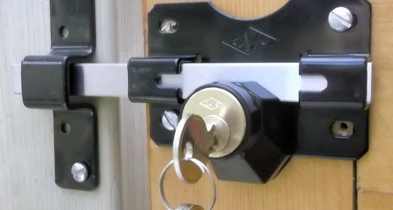 The lock can also be fitted on gates in the garden or those around the house. Last but not least, you may want to opt for the Gate Deadbolt with Square Stainless Steel Rim and as the name suggests, its made from stainless steel. It is ideal for gates of 1-3/4” thickness. You need a 2-1/8″ round hole and fit a 2-3/8″ backset to enable a perfect fit for the lock. Two keys and hardware for you to install it successfully are included in the pack. Note though that the inside parts of the lock are not made of stainless steel. Its only the outer parts that are made from stainless steel to guard against corrosion. The list of locks mentioned is not exhaustive. Many others are readily available but the choice of the most appropriate one will depend largely on your personal taste and the type of gate you have. The important issue here is for you have a safe and secure environment around your home.